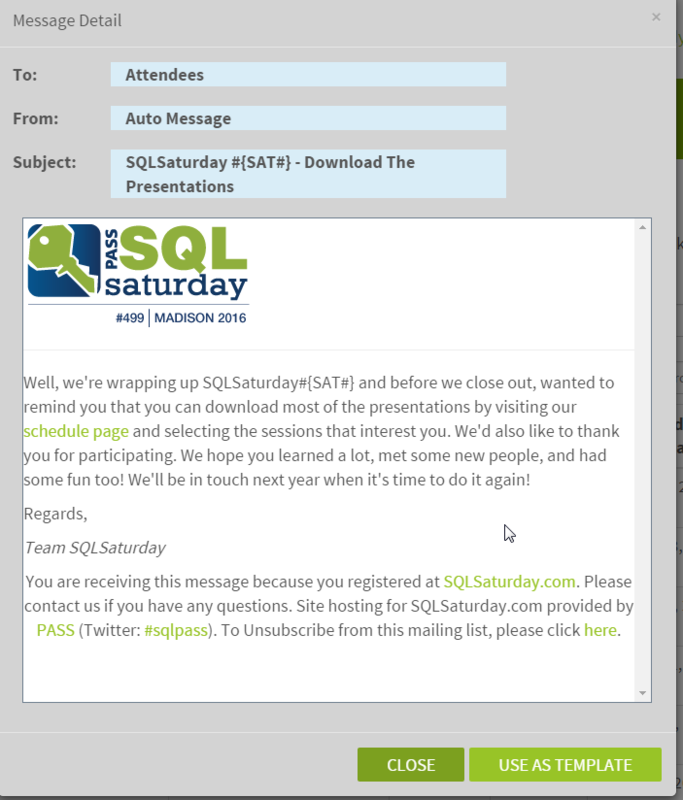 For those of you with access to the SQLSaturday admin site (used by event leaders) one of the things you can do is ‘borrow’ message templates from any event. Start at Message Center on the main menu, then Message History. Pick an event to see all the message they sent. Then click the pencil button (bottom right of first image) and you’ll be able to view it. If you want it, just click ‘Use as Template’ and it will load that message with the formatting into the message editor. You can mark up as you need to, changing text and/or formatting. Highly recommend you do your editing offline, then paste into the online editor when you’re ready to test – no worries about session timeouts or server errors. We added this back in the beginning to make it easier to share ideas for writing.